Step 1 Whisk together vinegar, 1/2 cup water, salt, mustard seeds, sugar, peppercorns, and chile de arbol, if desired, in a medium nonreactive pot. Bring mixture to a simmer over medium heat, stirring until sugar and salt dissolve, then let it cool to room temperature, about 20 minutes. Step 2 Place avocado slices in a 1-pint jar and top with the cooled brine. Refrigerate for at least 1 hour or up to 1 month. 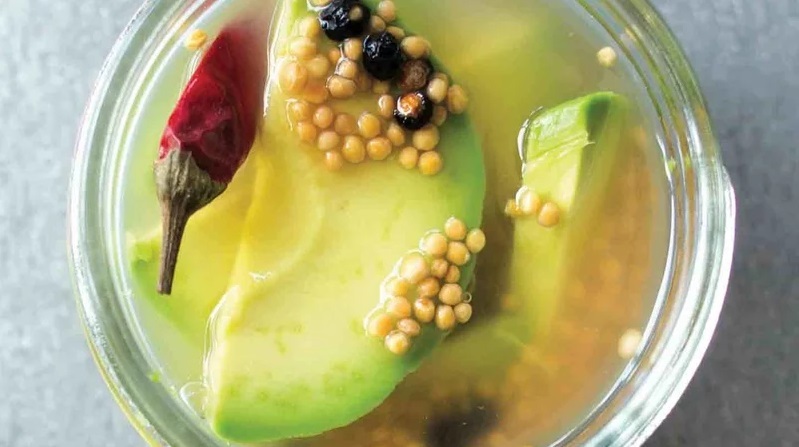 Use avocados that are not quite ripe in this recipe; pickling softens them.